Today is my Father-in-laws birthday! This afternoon Hubby, Miss 2 and I popped in for a visit with some chocolate lamingtons (his favourite). 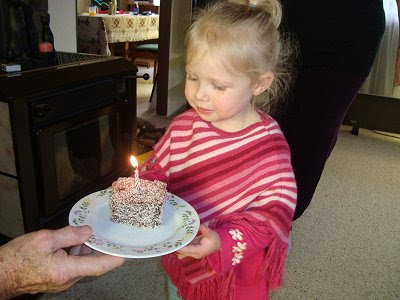 Grandma organised a candle and Miss 2 got to hand Granddad's lamington to him while we all sung "Happy Birthday". 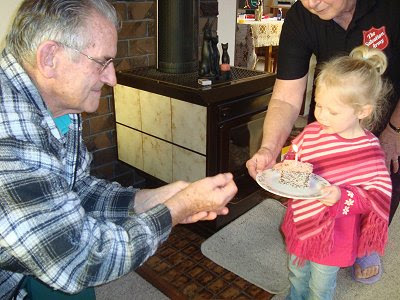 I must mention here that Grandad is a wonderful Grandfather to our kids (as well as being an awesome Dad and Dad-in-law)... he is one of those Grandads that is usually down on the floor playing games with the kids, tickling someone or offering lollies to someone. Today, Miss 2 was bursting with laughter, so much so that she could hardly breathe! Happy Birthday Grandad - we love you lots! I must remember the lamington cake for my dad. He loves them too. Miss 2 is growing up! I guess it wont be long and she'll be Miss 3! Yes happy Birthday to your father in law! how cute is miss 2 in her poncho!! Happy Birthday again Dad... have you checked your oil and water lately? Happy birthday grandpa. How special that she has him in her life. What a lucky little one to have such a playful grand dad! He's pretty lucky, too. You must be a wonderful daughter-in-law!